Five men and two teenage boys have been jailed for murdering an 18-year-old during a dispute between gangs. Sait Mboob was stabbed to death in Moss Side, Manchester, on 8 August 2017. 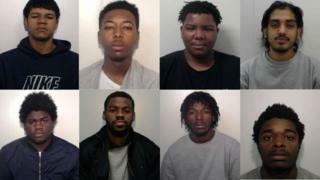 Four of the men were given 18 year sentences, the other was given 19 years and the two teenagers were both jailed for 14 years at Manchester Crown Court. They belonged to a rival group based in Ardwick and Longsight who "chased down" Mr Mboob in a "vicious" attack, the Crown Prosecution Service (CPS) said. All seven defendants were also convicted of grievous bodily harm for attacking three other victims. Emil Bell, 17, of Morbone Close in Levenshulme, was given a life sentence with a minimum of 17 years for the murder during a separate trial in February. The jury heard that Mr Mboob and his friends were outside a shop in Moss Side when they were told that members of a local gang were in the area and threatening violence. Minutes later, two cars drove at speed towards the group, with one of them hitting Mr Mboob and his friends. Occupants of the cars then jumped out and attacked the group with knives and machetes. Mr Mboob suffered a fatal stab wound to his leg which had cut through an artery, Greater Manchester Police said. The CPS said most of the attackers, who belonged to a rival group calling themselves '7M', "disguised themselves with masks and balaclavas". It was a "vicious, pre-planned attack" in "broad daylight" by the defendants who "acted together to chase down, corner and attack their victims", Alan Richardson from the CPS said. Det Ch Insp Terry Crompton said the sentencing was a "significant step" in a continuing investigation. On Monday, another man, 20, was arrested on suspicion of murder.